Gaetano Butera sets his sights on young Saro (Lo Cascio) when hes just a boy, sure that he’ll make a great recruit for his organization. Soon Saro is part of the mob’s day-to-day operations, quickly moving up the ranks as he demonstrates his talents and gets richly rewarded for his work. But when hes given one brutal assignment too many, something in him snaps – even knowing that his colleagues dont take such treachery lightly. Luigi Lo Cascio, one of the defining actors of contemporary Italian cinema, gives one of his finest performances in this revealing portrait of a young mans seduction by the Mafia that begins in the early 1980s and spans 20 years. Gaetano Butera sets his sights on young Saro (Lo Cascio) when hes just a boy, sure that he’ll make a great recruit for his organization. Soon Saro is part of the mob’s day-to-day operations, quickly moving up the ranks as he demonstrates his talents and gets richly rewarded for his work. But when hes given one brutal assignment too many, something in him snaps – even knowing that his colleagues don’t take such treachery lightly. 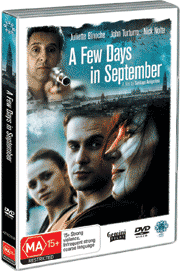 Director Porporati creates a disturbing study of the extent of Mafia involvement in everyday Italian society and the normalization of a regime of violence and corruption.